I’ve been putting in some serious sander time over the past couple of months and finally managed to get the hull to an acceptable state of fairness. On Friday, I managed to sneak away from the office to sand the “sealer coat” of epoxy I’d applied the previous weekend as well as prep the hull for priming. And yesterday I began spraying the VG23 in the hayloft with the first coat of System Three’s WR-155 primer. For some reason a few pigeons have chosen the last couple of weeks to begin overnighting in the hayloft, leaving a bit of mess on the hull for me to clean up before working. Before heading back to the city last night I pulled a tarp over the hull to keep the new paint from being damaged (you can see it lying to the left of the hull in the photo above). 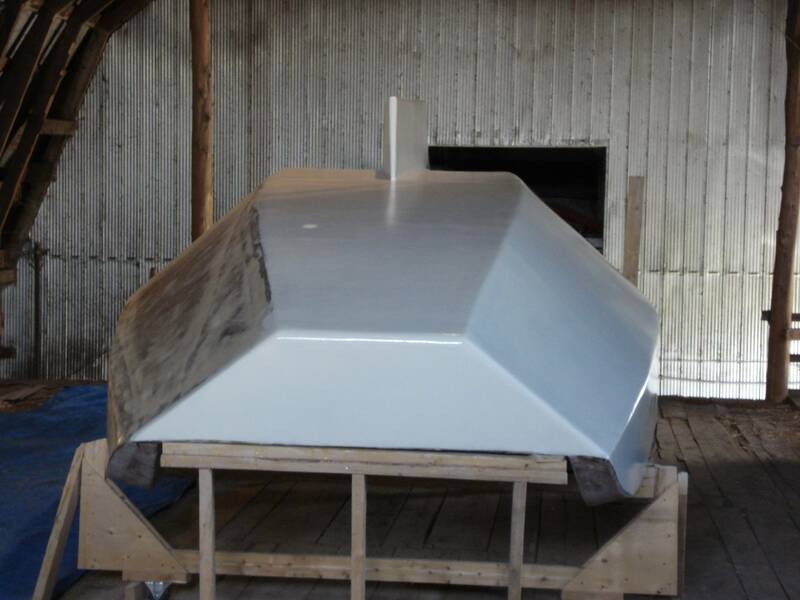 The primer was no longer tacky by the time the tarp was pulled over the hull but of course it was still pretty soft. I had a nightmare last night of the tarp becoming glued to the hull. Fingers crossed. I’ve added a few more photos to the photoviewer too. Wow!! The photos look great. The paint looks extremely smooth and professional. Did you “Roll and Tip” for just roll? I only rolled – that System Three primer is pretty forgiving. I’ll probably try roll and tip on the final coat of primer. At the very least it’ll give me a chance to practice with the technique. I tried a couple of different foam rollers and found that the ones intended for rolling epoxy did the best job. The thicker foam ones tended to leave areas that were too thick, eventually resulting in runs / sags. The only downside to the epoxy rollers is that they tend to take a beating and need to be changed frequently. There is no need to roll-and-tip the primer. Just roll some layers on to create a thick skin. Later you will sand aggressively the primer to achieve a smooth surface for the paint. Thanks for the tip Dimitris! Hey Andrew… I’ve been reading the progress on your VG23. This is better than a novel. Gripping! I am amazed at the amount of perserverence it must take to build this boat. I’ve been looking around for the right boat for me and my family. I really like the VG23 and the VG18. I think I want to build, however, after seeing the slow process, I don’t know if I’ve got what it takes. What made you choose the VG23 over other plans? Your boat is looking really sharp. I can’t wait to see more pics, especially pics of the launch. Shoot me an email if I can be of more help in your decision making. Regardless, get your family involved in the build and I think it’ll almost be more fun than the adventures you’ll have sailing the boat you build together. Hey Andrew… how goes the hay loft lady? We flipped her right side up last week. I have to write up a post about that – it was a real adventure…. Lots of pictures too. REally lookin good!! I have been following your progress since beginning but been awhile since I had posted. I am anxious to see your end result. I remember you earlier talking about possibly adding the extension on the transom similar to what Justin Pipkorn did with the VG20. Have you envisioned any other changes, especially to the interior? Keep up the good work. Anyhow, for now I’m going to focus on getting things finished topside and make that call when I have to. I finally uploaded some photos of the flip if you’re interested.